I just finished my similar triangles unit. As I’ve said before, it’s my least favorite unit that I teach in Geometry. Last year, I had my students enlarge cartoons using scale factors. Since I moved into honors this year, that project was a little too easy for my honors students. 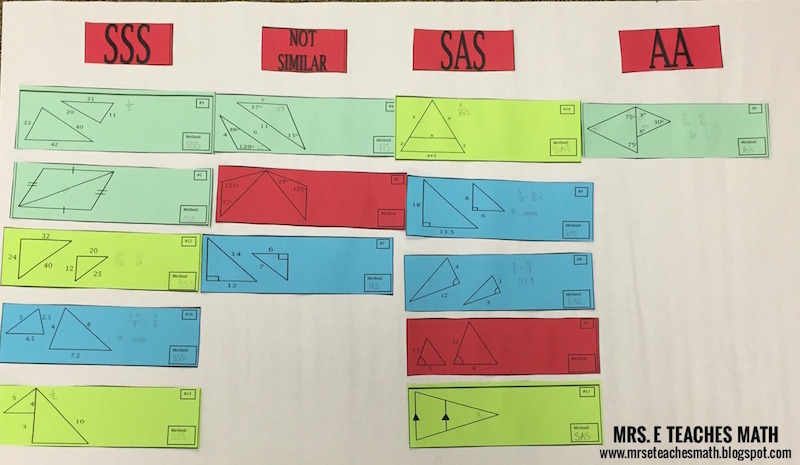 Secondary Math Shop gave me her Methods of Proving Triangles Similar Cut and Match Activity to try with my students. 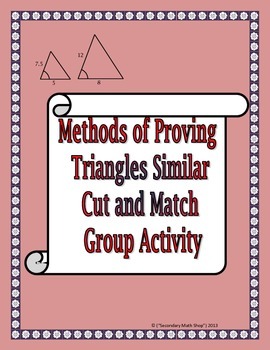 This activity is very similar to the Congruent Triangle Cut and Match Activity that I used earlier this year. I have giant sheets of paper (presentation pad paper) that I like to do these types of activities with. I put my students in groups of three and gave each group a sheet of giant paper. 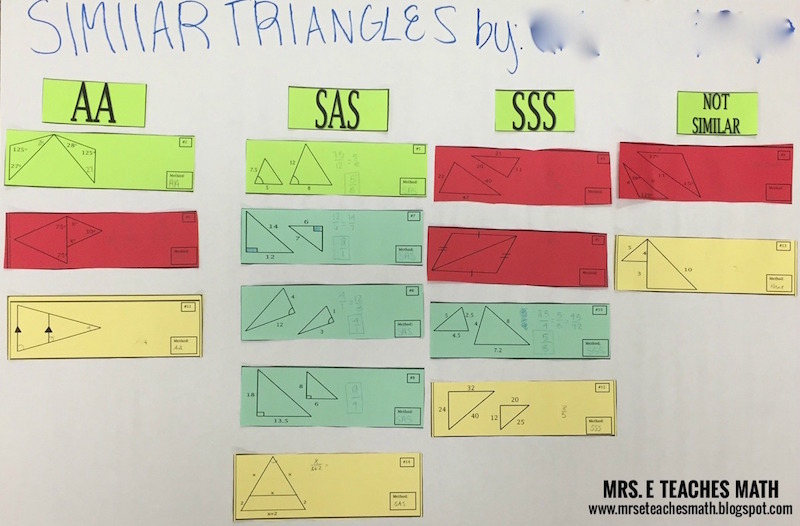 Then I gave each set of triangle diagrams. I like to be a little fancy, so I copied them on colored paper. I had each group cut the problem sets apart. I asked them to write any work on the slips of paper. They needed to list the scale factor (if enough information was given). I also had them mark any congruent angles or sides on the diagrams. When they were done, they sorted the slips into AA, SSS, SAS, or None and glued them onto the giant paper. As you can see, not all of the groups came up with the same answers. We hung the sheets around the class and the students did a gallery walk around the room to check the other groups work. They were only allowed to write questions on the sheets of paper, if they thought the group’s work was incorrect. Some of the questions were really good! Luckily, I still had a few minutes at the end of class to talk about some of the trickier problems as a class. This activity was very successful and really helped my students. 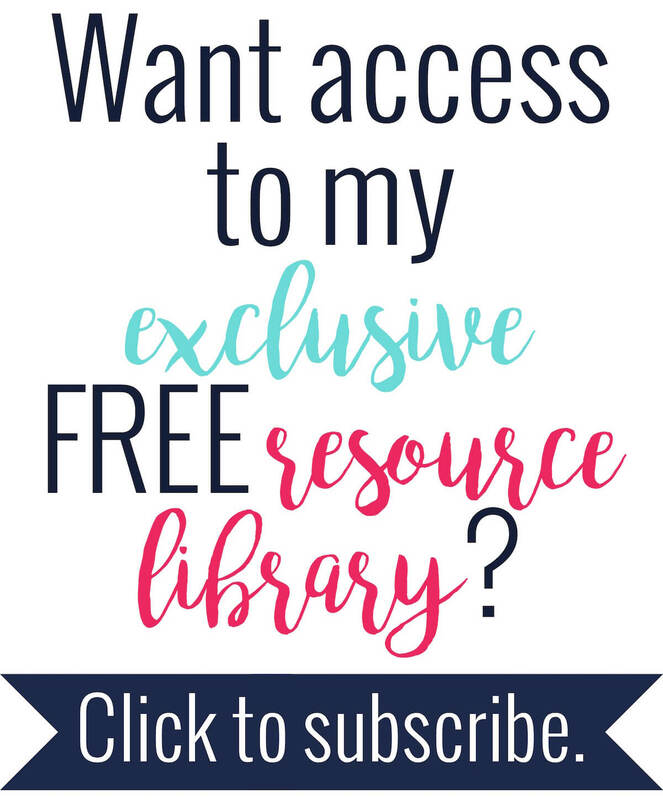 I like seeing them work together and this activity sparked some great conversations! 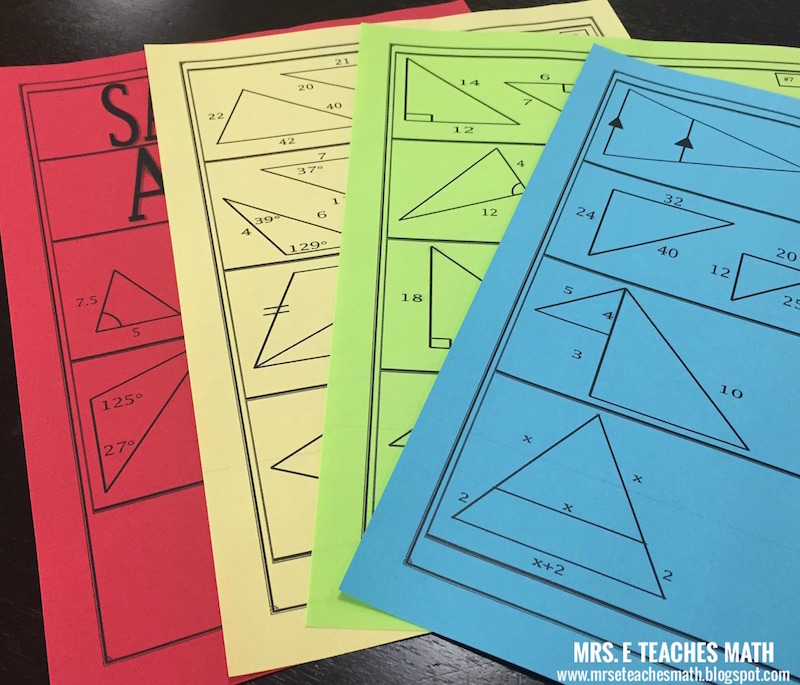 You can pick up this activity from Secondary Math Shop on TPT!